Deepwater GOM: Reserves versus Production - Part 1: Thunder Horse & Mars-Ursa The Oil Drum Got Storage? How Hard Can It Be? If one looks at the countries that are major importers of oil into the United States, Canada currently easily tops the list, exporting 2.085 mbd of crude (2.524 mbd of total petroleum products) for example in June. Interestingly Saudi Arabia was in second place at 1.164 mbd and Mexico had fallen to third place at 1.108 mbd. In light of the countries that used to occupy places on earlier lists and no longer do, it is worth noting that places such as Chad and the Congo are now on the list. This increase has occurred as the amount imported from Mexico has seen some of its lowest numbers. The numbers suggest a growing importance for that oil coming from the North. It was interesting, for example, to note that in the recent report reviewing available United States oil and natural gas authored by the National Petroleum Council, (which I discussed earlier) and which had Daniel Yergin as Vice Chair, that Canadian oil has begun to get counted with that of the United States in the more generic classification of North America, thereby acting as an anticipated aid in solving some of the “domestic” supply problems in the near future. Following that report, Dr Yergin wrote an article in the WSJ denouncing the idea of peak oil. Euan Mearns has provided his usual detailed and well-argued rebuttal to this (as does this entire series), so I will not go into that further at this point. I briefly looked at Canada when I was writing the earlier summary posts on the top 30 producers in the world. Looking at the reported and projected production for this year, production is anticipated to steadily climb once the summer months have passed. The increase reflects a steady increase in the component from Western Canada, which started the year at 91% of the total, but is anticipated to reach 93% by the end, largely on the basis of an increase in production from the bitumen of the oil sands. 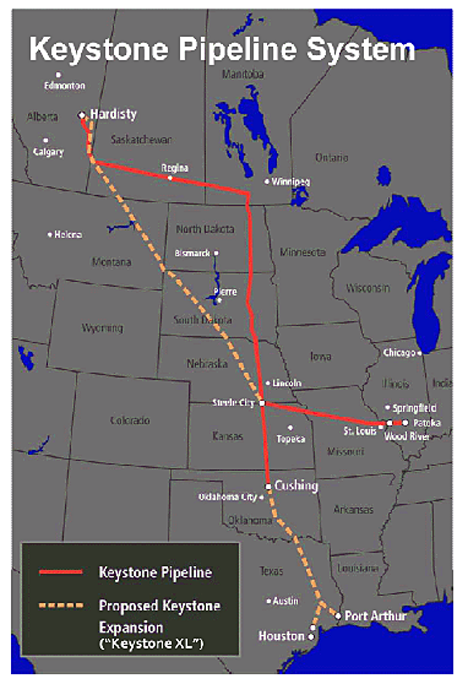 In passing it should be noted that not all the oil that will come from Canada necessarily started there, since, for example, there is currently a move to lay a pipe that would carry oil from the Bakken formation in North Dakota and Montana through Saskatchewan to the Enbridge terminal in Manitoba, and thence to refineries in the United States. Furthermore, not all future Canadian oil exports can be assumed to come to the United States. Two pipelines also being proposed are to run the 727 miles from Bruderheim, Alberta to Kitimat in British Columbia. The first of these would carry an average of 525 kbd west, while the second would transport back some 193 kbd of condensate, which would help to thin the crude going through the larger pipeline. Not surprisingly this $6.6 billion project is getting considerable support from China. Earlier this year, for example, five companies signed up for so-called firm service, or guaranteed access, to a portion of the Trans Mountain pipeline, which carries oil from Edmonton to a port at Burnaby, B.C. Among them is PetroChina International (America) Inc., a subsidiary of Chinese energy giant China National Petroleum Corp. The investment is not just in the pipelines to get the crude to China, there has also been a growth of Chinese acquisitions of shares in the companies extracting the oil. Recognizing that, in contrast with many exploratory operations, the presence of the oil in Alberta is much more certain, the risks of investment are reduced and a return, or in this case the oil itself is a much more certain outcome. As a result there are now more Asian companies entering the oil sand business. I challenge any of you to name one other country in the world that only has one market for its largest export. Right now our most valuable resource is landlocked in North America and isolated from the world market. That means it is often isolated from world price. The August spread between West Texas Intermediate and Brent Crude, the world price, was $22 per barrel. Canadian heavy crude has more often than not sold at a discount to U.S. light crude that goes well beyond the quality differential – simply because of lack of market. In perhaps the same way as they acted to provide a second market for the natural gas of Turkmenistan (other than Russia), thereby allowing the Turkmen to be able to sustain higher prices; now they can to some eyes be seen as riding to the rescue of Canadian prices. And then there is the controversial Keystone XL pipeline set to run from Alberta down to Houston and refineries south, and which is generating some high-level opposition. There are some current indications that the State Department will approve the pipeline, permission needed since it crosses an international border. It may not hurt those chances that the chief lobbyist for TransCanada was, apparently, the deputy manager of Secretary Clinton’s 2008 campaign. The latest step by the opposing forces has been to challenge the permit that TransCanada has to carry out construction on the Canadian side. Apparently the delays that are holding up the start of construction of the 700 kbd pipeline have carried the project beyond the year during which TransCanada had permission to start construction, without such construction beginning. On the other hand, TransCanada is pointing to preparations for river crossings and the laying of foundations for oil storage tanks as evidence of such construction. It is expected that with this increased demand, production from the oil sands will double by 2020. This expansion is not without demands of its own, since the use of natural gas in the mining process (see earlier posts) will lead to an increase in demand from 1.1 bcf to 3.0 bcf to help in that production gain. And so I will take another glance at the plans for the oil sands in the next post in this series. Did Libya figure in that top 15 list last year? 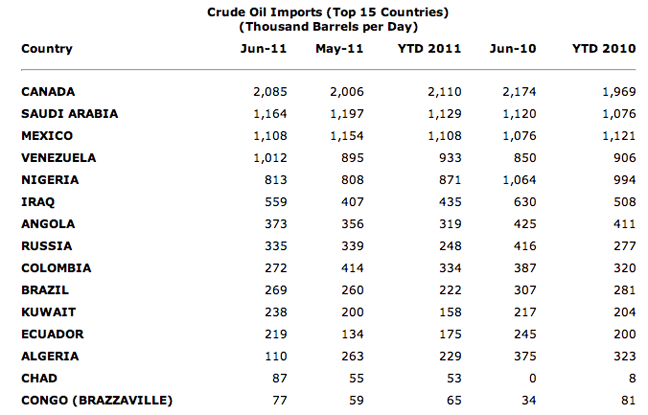 In 2010 Libya averaged 51 kbd of oil exported into the United States, about 0.5% of total US crude imports. The number had been steadily declining since 2007. The recent restart of imports from there has the oil flowing to Hawaii, I believe. Doesn't Canada import significant quantities of oil to its Atlantic coast, making its supply to the U.S. indirect imports from the Middle East? Figures I've seen from 2006 or so were that imported oil was over 50% of Canadian domestic consumption. While tar sand production in Canada has grown since then, has Canada become a net exporter of oil? EDIT: This TOD article from 2009 says Canada has modest net exports after its East Coast imports. Canadian import/export data is complicated by the fact that Canada is both an importer and exporter of both crude oil and oil products. Some of the big Atlantic coast refineries, including the biggest one in Canada, import foreign crude oil and export most of their output to the United States. According to the Canadian Association of Petroleum Producers, the "apparent" consumption of crude oil and products in Canada was about 1.6 million barrels per day in 2009. Since Canada appears to be producing about 3.0 million bpd of oil in 2011, and I doubt domestic consumption has increased lately, I would say that about 1.4 million bpd of Canadian oil production is now going to export on a net basis. Canadian governments don't really care about the net export calculation so you have to do it yourself. They are only concerned about the balance of payments and the tax revenues, which are highly positive. I would commend Heading Out for a pretty accurate and politically neutral summary of the Canadian export situation as it currently stands. There has been more heat than light coming out of the US press and politicians about it lately, so this helps. I would add that, in addition to Enbridge's 525,000 bpd Northern Gateway pipeline proposal from Alberta's oil sands to the northern BC's of Kitimat, Kinder-Morgan is proposing to expand its Trans-Mountain pipeline from Edmonton to Vancouver, BC from 300,000 to 700,000 bpd. Of that 700,000 bpd, 1/3 would go to refineries in BC and Washington State and 2/3 would go - elsewhere. Guess where. Shipping around 450,000 bpd of oil out of Vancouver would seem to be a bit dicey given the shallow channels and lack of clearance under the bridges, but the Metro Vancouver port authority seems to be keen on the concept, and the money. Kinder-Morgan seems to be doing this completely under the radar since it doesn't need many government approvals - it's just expanding an existing pipeline - so it doesn't seem to have gotten much play in the popular press. As H.O. noted, US political pundits seem to be counting Canadian oil production (currently 3 million bpd or so) as part of "North American" production, and then continuing on to imply that "American" production, i.e. US production, will soon reach new peaks. This is highly misleading. 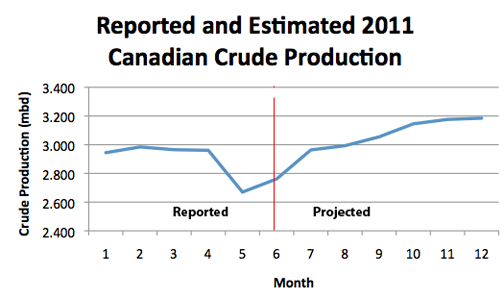 Most of the new "North American" production in the last decade is oil sands output from Canada. Canadian production is only rising 100,000 bpd per year, but that adds up to 1 million bpd per decade, and after a few decades it starts to get big. Certainly North Dakota's 300,000 bpd or so of new production is a healthy contribution, but they're also missing the fact that a lot of ND's oil is going to market on the Canadian pipeline system, which conveniently runs through ND. In fact, many ND producers without pipeline connections are trucking oil north into Canada, and then putting it into the Canadian pipelines in Saskatchewan. I was going to mention the TMX expansion too, HO's article refers to the line to Burnaby, which is basically East Vancouver. Globe and Mail covered the various plans afoot in Feb: Kinder Morgan plans pipeline expansion to B.C. - The Globe and Mail. They mention the prospect of Canadian crudes stepping in for AK if when the TAPS eventually goes offline. Another factor is capacity, the Kitimat port will be deepwater and handle VLCCs. Bringing in tankers that large to Puget Sound has never happened; perhaps the water is too shallow, but also there's US/WA state legislation forbidding ships above a certain size from entering the Sound - or going through the Straits of Juan de Fuca? Afromax, I think. Not certain if Canada/BC respect this bit of legislation. No doubt the tar sands should be producing oil long after TAPS oil quits flowing but Shell looks to betting that won't be happening for a while yet. Well Lousiana is making a couple buck off Shell's arctic look see anyhow. Shell has bet money on all the horses in this race. They have a massive oil sands mine near Fort McMurray and an oil sands refinery near Edmonton. The Arctic venture is more speculative in nature. The Trans-Mountain pipeline in BC has connections direct to the refineries in Washington State, so they don't have to worry about the depth of water in Puget Sound. Canadian oil will not be going to Washington by tanker. California, maybe, since there are no oil pipelines going from Canada to California. Your Tech Talks are a great feature of TOD. I'll do the honors: Tech Talk - Venezuela, heavy crudes, API gravity and refinery gains, and also Tech Talk - Past, Present and Future Venezuelan oil production. This expansion is not without demands of its own, since the use of natural gas in the mining process (see earlier posts) will lead to an increase in demand from 1.1 bcf to 3.0 bcf to help in that production gain. Given what Art Berman and others have written about the realities of shale gas, "higher cost and less abundance". I wonder whether there will be enough gas to increase tar sands production to the levels suggested? There may be a lot of people in the near future wondering why it became so expensive to heat their homes with natural gas? The Alberta government intends to curtail exports of natural gas from the province and divert the supply to the oil sands. This will provide more than enough natural gas to supply the oil sands plants, as well as the rest of Alberta industry and consumers. The law under which this will be done was passed in 1949, so it's a little late to object to it. Unlike US states, Canadian provinces have the constitutional right to do this kind of thing. I doubt that the US is concerned about this since it has a large surplus of shale gas at the moment which is severely depressing domestic prices. Rocky - Beside the US are any Canadians going to have NG curtailed away from them? Like maybe Abertan residential NG users? Mexico is doing even worse than the table suggests, their imports from the U.S. have been skyrocketing, a lot of oil is shipped here, refined, and then shipped back.